25,000 slip and fall accidents occur daily in the U.S., accounting for 15 percent of all workplace accidents. It is also the leading injury to people on company premises. Back injuries account for more lost work time than any other workplace injury. Often, the source is improper lifting. Fires in commercial buildings cost more than $2 billion in annual property damage and loss. Lack of, or improper maintenance of sprinkler systems plays a significant role. Musculoskeletal disorders results in over $45 billion in loss wages and productivity costs. Organized office workstations and poor ergonomic practices are contributors. Adverse weather is the leading cause of vehicle accidents and fatalities. Many company drivers don’t understand the risk or how to adjust their driving behaviors. Falls from ladders injure over 20,000 American workers annually. Some injuries result in permanent disabilities and even fatalities. 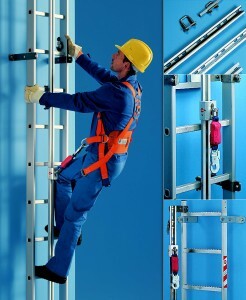 Safety starts before the ladder is even mounted.